Tolis Dimopoulos has used co-working spaces as an attorney for startups, but he said none have been great places for doing business. That changed, Dimopoulos said, with his move to Atlas Workbase, a 20,000-square-foot co-working space that opened this month in the Lumen Building at 500 Mercer St., across from the Bill & Melinda Gates Foundation. He declined to say what he pays, but said it is half his previous rent for office space in Fremont. Dimopoulos is the attorney for Atlas Workbase. He said he did not get a break on his Atlas rent, and is not an investor in the company. Bill Sechter, the company’s founder, president and CEO, said Atlas is for anyone who wants a professional, quiet and comfortable space — from startups to major companies. “So much of conducting business is negotiating a deal, giving a presentation, collaborating,” he said. Visitors to Atlas are greeted by a concierge. Acoustics are designed for privacy, and there are rooms for private conversations, private and open offices, and conference rooms. The space comes with ergonomic furniture and sit-and-stand desks, and there is technology for meetings and on-site tech support. Atlas has a members-only section called The Concourse, with private offices and workstations, and a place for socializing and networking. There’s also The Lounge for members and day users. The company said it is designed to be like an executive airport lounge with community seating, sofas, chairs, collaboration space, video conferencing and a quiet library. FedEx Office Print & Ship Center and a coffee shop called Konvene are in-house and pay Atlas rent, the company said. “Atlas is a marriage between co-working and Third Place for everyone to work and conduct business,” said Sechter. Monthly packages start at $229 for The Concourse and $199 for The Lounge. So far, Atlas has about 20 clients. Atlas leases its space from 500 Mercer Partners, LLC. It was formerly an OfficeMax and has only one wall of natural light. Sechter said controlled LED lighting helps distribute light throughout, and works as a design element. Gensler designed the co-working space and the acoustics. Vendors for the Atlas prototype include Open Square, Steelcase and Philips Lighting. Exxel Pacific did the tenant improvements. Susana Covarrubias of Gensler said the space has unisex bathrooms — something that’s “very Seattle” — bringing together all the workforce in potential interactions. 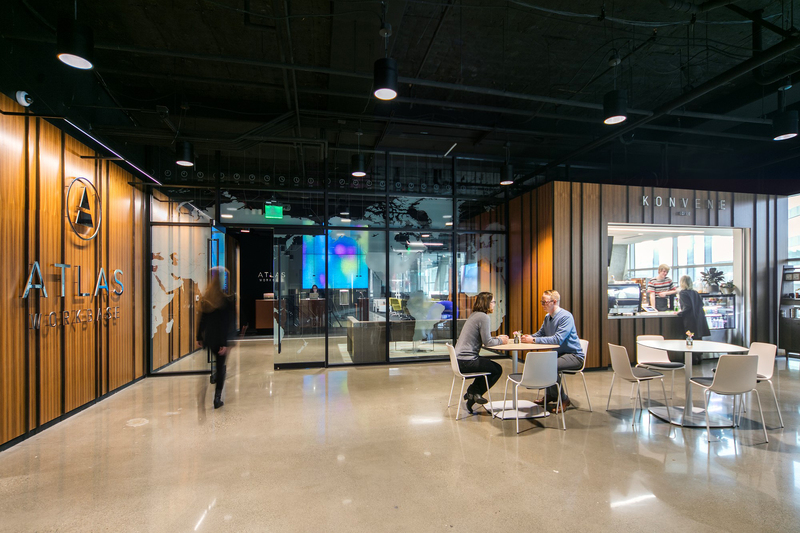 Covarrubias, the design principal for interiors at Gensler in Seattle, said clients like both traditional offices and co-working spaces. “Staying within the boundaries of your company is not enough,” she said. Such spaces can benefit companies because they are a platform for new ideas and bring together creative people, she said. Atlas’ sophisticated aesthetic along with its equipment and technology help people do business, she said. Sechter said he has traveled a lot in sales, business development and operations, and worked for Fortune 500 companies as well as startups, including Kinko’s (now FedEx), and LearnLive Technologies. He began developing the business for Atlas Workbase while getting an MBA from Seattle University. This first Atlas is above a QFC grocery in a mixed-use building developed by Seattle-based Landstar Development. Sechter said Alan Winningham of Landstar partnered with him on the idea of Atlas, but declined to say if Winningham is an investor in the privately held company. Sechter wants to expand Atlas nationally and potentially globally. He said Atlas is in negotiations for Seattle locations, and is looking for 15,000- to 60,000-square-foot spaces near transit, preferably with parking. According to a study by Instant Group, co-working grew more than 10 percent across the U.S. in 2015, with the largest markets being New York City, San Francisco, Austin, Seattle and Los Angeles. Outside of these places, Instant Group reports growth is restrained and more fixed on the traditional office model. Dimopoulos said Atlas meets the needs of his Seattle-based firm, Sophos Law.